The first switch is a simple "on" / "off" switch, such as you might find controlling a table lamp. The other two are both "momentary" switches. They are "momentary" in that they won't stay in one of their two possible states. Doorbell switches are almost always momentary switches... they only stay "on" while someone is pressing the button. 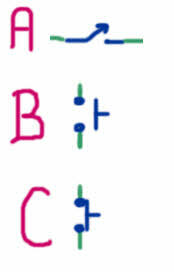 Switch "B" would be suitable for a simple, normal doorbell circuit. Momentary switches are always drawn as if there is no finger changing them to the state in which they won't stay. Be aware that some momentary swiches are operated by something other than a finger. Switch "C" may be less familiar. It is closed, i.e. set to allow electricity to pass, unless the "finger" is present, "pressing". My newest site. (There are links to it's content here, but the search won't include those pages. ).